These stunning spaces could convince anyone to cook! As the saying goes, the kitchen is the heart of the home, and that couldn’t be more accurate! It’s where you cook daily meals for you and your family and where friends gather when hosting a party. With so much time spent in the kitchen, it’s important the space be equal parts functional and beautiful. Nobody wants to cook in a rundown dingy space! 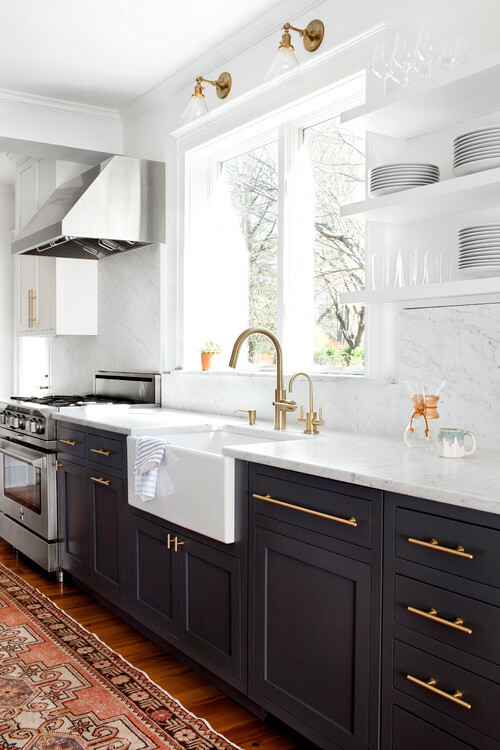 Whether you’re planning a complete kitchen renovation or you’re just looking for a few updates, these stunning kitchens are sure to inspire you. Two toned kitchens have a big visual impact and seem to be all the rage. I love how the white upper shelves were designed to disappear into the white walls allowing the lower cabinets take center stage. A kitchen island is on every homeowners most wanted list, so what’s better than having one? Having two! I have a soft spot for butcher block countertops. I love their natural beauty and how they add warmth to the cool tone cabinets in this kitchen. You truly can’t go wrong with a high contrast black and white kitchen. I love the fun floor tile and how it ties in the upper and lower cabinet colors. This is such a beautiful approach to a stark white kitchen. I love the subtle warm hue of the cabinets and the classic subway tile backsplash. I’m a sucker for an all white kitchen, especially with brass hardware! There’s just something about a white kitchen that always look so fresh, bright, and clean. Those wood beams on the ceiling may be my favorite part though! This waterfall island is a bold statment in this simple galley kitchen. The heavy graining in the countertop is stunning! I wish I could have open shelving this put together – Swoon! Love how dramatic these dark floor to ceiling cabinets are yet the space still feels light and airy. Love this eye catching chevron backsplash! Backsplash is an affordable way to update your kitchen and add style. What’s a must have in your kitchen? Comment below, we’d love to hear!